Projects portfolio. Not bunch of certificates. Why build solar & smart energy systems project? Solar and Smart Energy Systems Course involves hands-on experience on renewable energy and smart systems. These two technologies, in combination with each other, are going to have a huge impact on our future. 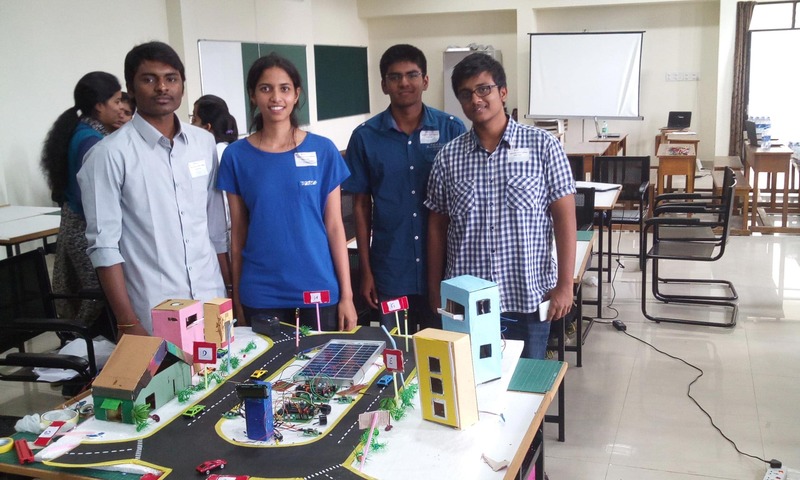 In this project, you will build one such system to handle traffic in a smart way using solar energy. Isn't it a good problem to solve? You will learn to harness solar power and build smart traffic signals which will automatically adjust their timings based on traffic direction. In this course, you will learn to develop two energy efficient projects. First you will develop a solar battery charger device with solar panels and then build a smart traffic control prototype which can automatically control the traffic signal based on the vehicle intensity on road. You can also use the solar charger to power up the traffic system. Module 1: What are Smart Energy Systems? Learn: What are Smart Energy Systems? Review: What are Smart Energy Systems? Review: How does a Solar Panel Work? How can you build this solar & smart energy systems project? Get access to course instantly. Kit will be shipped within 24 hours. Signup and try our first few chapters free of cost! Pay only when you like it. Our experts will visit your college/ school/ office with the kits and conduct an awesome hands-on workshop. Learning will not be more fun than this! How to build a solar & smart energy systems project? Login to our online learning portal will be provided instantly upon enrollment. The portal will have video lectures, tutorials, and quizzes required to build the solar & smart energy systems project. Kits are well tested and shipped to your doorstep in 24 Hours. Use the kit along with the online portal to complete the project at your home itself. You can enroll for free demo to understand how it works better. Pay only when you are confident and if you like it! How much time do I have to complete the solar & smart energy systems project? You need to complete the project within 45 days of enrollment. Generally, the project would take 16-20 hours to complete. What will be in the solar & smart energy systems project kit that I will receive? Digital IR Sensors - 4 Nos. Color LEDs - 8 Nos. 9V Battery Connectors - 2 Nos. Multimeter and Battery (6F22 9V) are required for this project. Shipping these items isn't possible due to the logistics issues. These items are easily available in your local market. Our team will assist you in getting these items if needed. Should I enroll in Online Course or Offline Workshop? Can my friends build along with me? Ofcourse, and we strongly encuorage that. The course is fun and learning is more effective when you work together, learn together and build together! A team can have maximum of 5 members. All team members will get separate logins and certificate. One kit will be sent per team. Am I eligible for this course? If you have written even 5 lines of code in C in your life, you are eligible. The course covers content from very basics. So you can enroll without much prior knowledge in Arduino and Robotics. What is needed is a strong desire and passion to build projects! Who will clarify my doubts? Our expert trainers are available to clear your doubts. It is very simple. You will just have to select a time slot that is suitable for you (you will see this option once you start the course) and your trainer will call you at that time and help you. The doubt clarification sessions are always 1-1. So you can ask as many doubts as you want any number of times! Why should I choose Skyfi Labs? Skyfi Labs, a venture by IIT Kanpur alumni, was founded with a motive to make learning by building projects super easy for students all across the globe. Training 2,50,000+ students across 30+ countries, Skyfi Labs got prestigious awards like 2nd Best Business Venture Award, Ideas, IIT Kanpur | 30 Most Promising Startups, Next Big Idea, IIM Bangalore | Runner-up, UnLtd India Growth Challenge etc. Our courses have also been in the curriculum of IIT Delhi for the last 5 years. With such an experience, you can be rest assured that you will get quality project training from Skyfi Labs. If you still dont like it, dont worry. We offer 100% refund if you apply within 3 days of receiving the kit. How can I contact Skyfi Labs? We prefer email contact as that can be replied by the right expert who can answer your question!